Watercolor is a media that you do not have to use the same paint brand used by the artist. Instead as long as you have a similar paint color you can use any brand you personally prefer. There are many inexpensive watercolor brands available which will work very well if you do not want to invest in an expensive set. There is something so appealing about the transparent effect you can achieve with watercolor. I have included paint swatches of all of the paint colors that I used for this project; this will help you find something similar in a brand that you use. If you want to try your hand at using these watercolor techniques with acrylic paints I have included a conversion chart which will give you the paint colors only for Deco Art Americana Conversions. I do not include acrylic instructions, only the paint colors. You can easily use acrylics with watercolor techniques on watercolor paper. 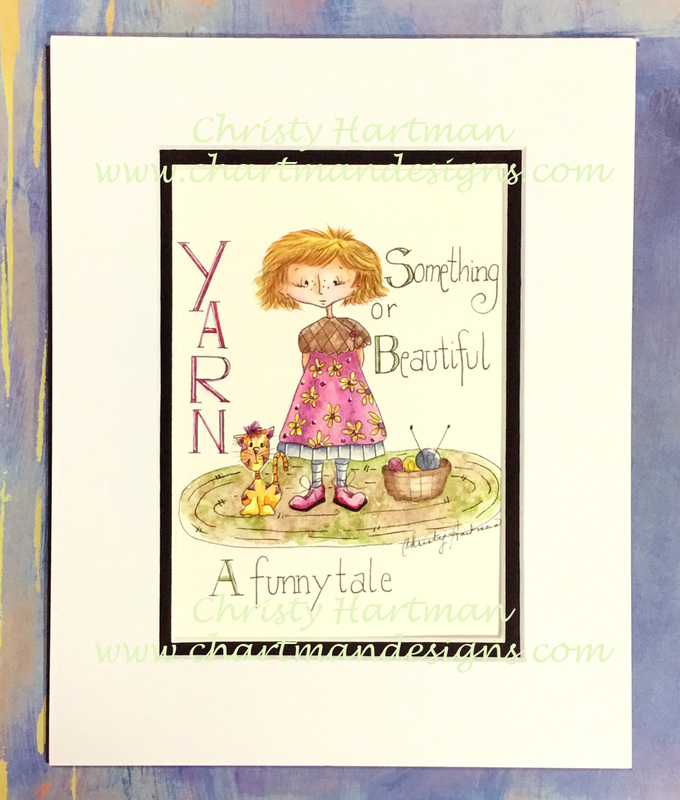 You are purchasing the Digital Watercolor Pattern: Yarn a Funny Tale or Something Beautiful. Elise Loves Knitting which is the second pattern in an ongoing series containing the character Elise. This pattern contains 23 photos showing you step by step how to complete this project. The line-art and full watercolor instructions are also included. This pattern reminds me of a little illustrated book of this character. There is also a bonus if you would like to change the lettering on your piece. Once payment has been verified you will receive an invoice with the Green Download Button on the Paid Invoice. If you have any problems downloading your pattern I have a PDF on the homepage explaining the process. All patterns and designs are copyright C. Hartman Designs © 2003-. All Rights Reserved. Design by Flying Orange. These projects may be painted for personal use/personal profit but may not be reproduced for graphic or scrapbook use for resale. Photocopying and all other types of mechanical reproduction are prohibited. Materials, projects, and products on this site may not be republished, distributed, transmitted, displayed, broadcast or reproduced for any business/commercial purposes without written permission from the artist.